In part one (see here) I mentioned a PowerShell script (Export_DistroGroup.ps1) that I wrote to export certain settings of distribution groups in preparation for migrating them to Office 365. File 1: Human Resources-Managers.csv – Contains the contents of the ManagedBy attribute. File 2: Human Resources-AcceptFrom.csv – Contains the contents of the AcceptMessagesOnlyFrom attribute. File 3: Human Resources-AcceptFromDL.csv – Contains the contents of the AcceptMessagesOnlyFromDLMembers attribute. File 4: Human Resources-MemberOf.csv – Contains a list of groups of which “Human Resources” is a member. File 5: Human Resources-Members.csv – Contains a list of the group members. File 6: Human Resources-Addresses.csv – Contains a list of all group email addresses plus the LegacyExchangeDN attribute. File 7: Human Resources-Settings.csv – Contains the group’s HiddenFromAddressListsEnabled and RequireSenderAuthenticationEnabled attributes. It’s simple to add more attributes to this file if you need them. Just edit the Export_DistroGroup.ps1 and Import_DistroGroup.ps1 scripts as required. If any of these attributes are empty, the script skips creating that file. Remember: Evaluate this code and your environment carefully before using it. No guarantees. No promises. Use at your own risk. # retrieving the groups that this group is a member of. # Specify your desired output path here. # Load the Quest AD snapin. # Get the distribution group and save it to a variable. # UserPrincipalName for the manager(s). # If the manager is a user, save it as $Manager. # If the manager is a group, save it as $ManagerGroup. # Get the UserPrincipalName for the Manager or ManagerGroup. Write-Host "Exporting the group's owners..."
$ManagersFile = $OutPath + $Group + "-Managers.csv"
# get the UserPrincipalName for all entries. # skip the file creation. "Exporting the group's AcceptMessagesOnlyFrom attribute..."
$AcceptFromFile = $OutPath + $Group + "-AcceptFrom.csv"
# groups, skip the file creation. "Exporting the group's AcceptMessagesOnlyFromDLMembers attribute..."
$AcceptFromDLFile = $OutPath + $Group + "-AcceptFromDL.csv"
# other groups, skip the file creation. Write-Host "Exporting the group's up-stream nested membership." $MemberOfFile = $OutPath + $Group + "-MemberOf.csv"
# UserPrincipalName attribute of the hashtable. Write-Host "Exporting the group's members..."
$MembersFile = $OutPath + $Group + "-Members.csv"
Write-Host "Exporting the group's addresses..."
$AddressesFile = $OutPath + $Group + "-Addresses.csv"
# other non-list attributes, this is a good place to add them. Write-Host "Exporting the group's miscellaneous..."
$SettingsFile = $OutPath + $Group + "-Settings.csv"
Let me know if you see any errors. It’s possible I made some mistakes while formatting the code for the blog and it’s equally possible that WordPress or my theme has introduced errors in its own format second-guessing. 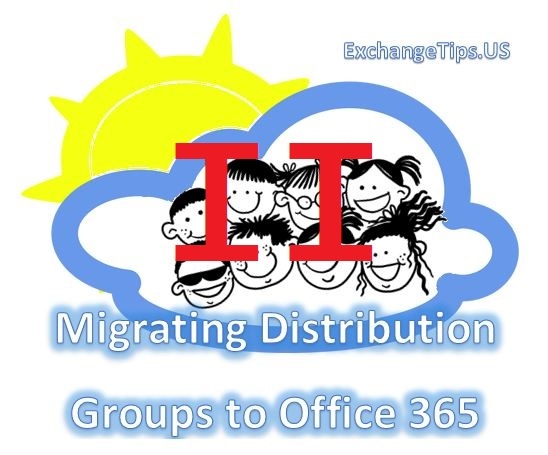 ► Part 1 – Overview of the process I used to migrate my Exchange distribution groups to Office 365. ► Part 2 – Exporting your on-premises distro group settings to CSV files. ► Part 3 – Importing your group settings from the CSV files to Exchange Online. ► Part 4 – Renaming and addressing your online distro groups. ► Part 5 – Rebuilding your Dynamic Distribution groups online. 1. Gather data. I exported a list of all distribution groups and their properties to a csv file. Then I wrote a PowerShell script (Export_DistroGroup.ps1) to export key details to multiple csv files for each group. Run get-distributiongroup -resultsize unlimited | export-csv C:\Temp\AllDistroGroups.csv -notypeinformation from the Exchange Powershell console and you’ll get a csv file (c:\temp\alldistrogroups.csv) containing the names and other info for all of your on-prem distro groups.